Harold realizes that there isn’t any moon, “and Harold needs a moon for a walk in the moonlight,” so he stretches up on his tip toes and draws a quarter moon as high as he can. (Keep an eye on that moon.) Harold has made an important discovery: instead of scribbling, he can make meaning with his crayon, he can create things that were not there before. “The short cut led right to where Harold thought a forest ought to be. He didn’t want to get lost in the woods. So he made a very small forest, with just one tree in it.” Children reading the book can see how easy it is for Harold to represent a tree with a few simple lines. The book is not only an encouragement to imagine landscapes and stories: it is a drawing guide. On the next page we see Harold drawing circles on the tree. Like many artists, Harold’s creation takes an unexpected turn. “It turned out to be an apple tree.” Is Harold hungry? “The apples would be very tasty, Harold thought, when they got red.” But they are not red; they are purple. Harold only has one color crayon. Crockett Johnson’s 1955 children’s book is metafictional because it shows us how an artist creates a drawing, laying bare the process of its creation, but if the drawings were made with a red crayon, could Harold really eat the apples? If he existed in a world above his creation, as is the case with most sane artists, he wouldn’t be able to eat them. This then is our central question. 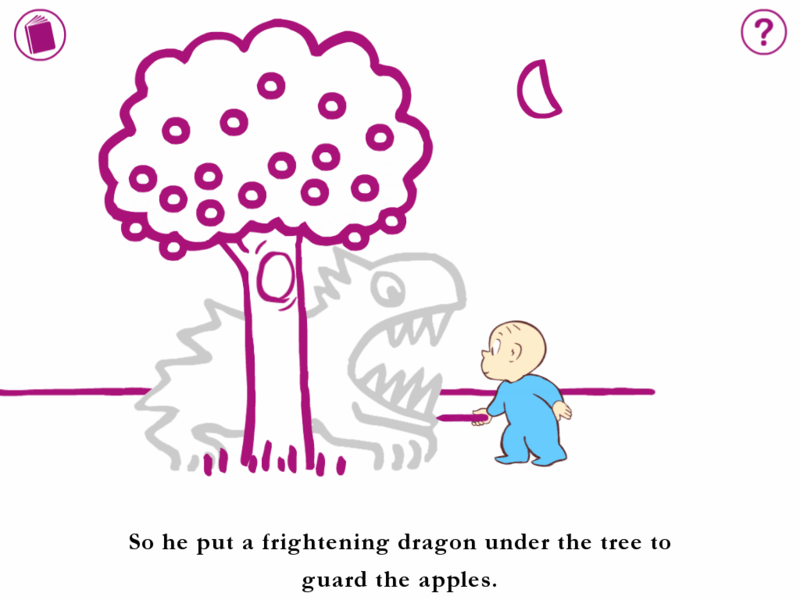 Harold puts a frightening dragon under the tree to guard the apples, but it was “a terribly frightening dragon.” Harold, like many other artists is surprised by the effectiveness of his own creation. Perhaps he is even surprised that he was capable of producing such a frightening and violent image. Was there a side to Harold that even Harold was not aware of? “He backed away. His hand holding the purple crayon shook.” What did this unintentionally shaky line represent? When Harold notices it, he sees that it looks like water. “Suddenly he realized what was happening. But by then Harold was over his head in an ocean.” Harold is drowning in his own art. Does he then exist in the world of his own creation? 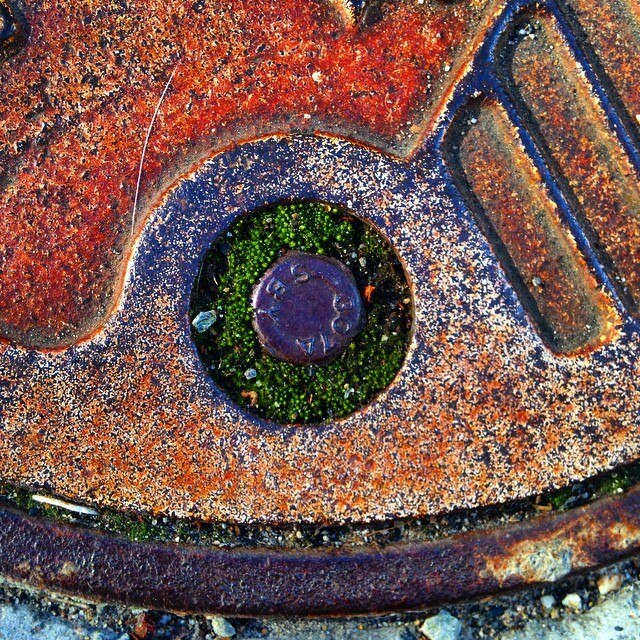 Many artists are overwhelmed, absorbed by their own works. But Harold “came up thinking fast.” He draws a trim little boat. If artists can paint themselves into a corner, they should be able to draw themselves out again. As he sails away from danger, there is no need to redraw the moon. For some reason, “the moon sailed along with him.” Harold, leaning back in his boat is happy. He is no longer drawing for a time. Instead he passively enjoys the sailing trip. “After he sailed long enough, Harold made land without much trouble.” In other words, Harold has recuperated from the shock his own monster caused and is able to draw a straight line again. He illustrates an anchor and steps onto the beach, “wondering where he was.” It’s a very good question; Harold is lost. But Harold has something else in mind. “There was nothing but pie. But there were all nine kinds of pie that Harold likes best.” Harold does not need to represent the different flavors of pie. Harold’s imagination, as represented by the text, suggests that they are different. We do not see Harold eating, but on the next page a quarter of each pie is missing. That’s two and a quarter pies, but Harold’s stomach is not distended nor is he overwhelmed with all he’s eaten. How filling were the illustrated pies? While Harold was aware previously that he could not eat the apples, he has now been fooled by his own illustration. Harold doesn’t want “to see so much delicious pie go to waste,” so Harold leaves “a very hungry moose” (you can see the ribs on his side) and “a deserving porcupine to finish it up.” Why is the porcupine deserving? We cannot know, except that he is smiling and very cute. Harold went off looking for a hill to climb, so that he could see where he was. As he climbs, he realizes that the higher up he goes, the farther he can see and if “he went high enough, he thought, he could see the window of his bedroom.” Harold is looking for a way home. Now we know that he is indeed lost. So he draws a mountain. Like Where the Wild Things Are by Maurice Sendak, Johnson’s book acknowledges that imagination carries a child away from the world of his or her parents. After a time in this imaginary realm, there is a desire to return, a desire to go home again. Harold reaches the top of the mountain, but “as he looked down over the other side he slipped– And there wasn’t any other side of the mountain. He was falling in thin air.” Harold has moved beyond his drawing and slipped into the void. Would this be akin to running out of ideas for a painter or writer’s block for a blogger? Harold, however, is quick to react once again; he draws a balloon. We are told that he has a fine view from the basket — although we don’t know what he is seeing. He seems to be looking down at the text, but he cannot see it. He knows that he is in a drawing, but he does not know that he is in a children’s book. He lands the balloon by drawing houses at his own level, with windows, and grass around the basket. Unfortunately, “None of the windows was his window. 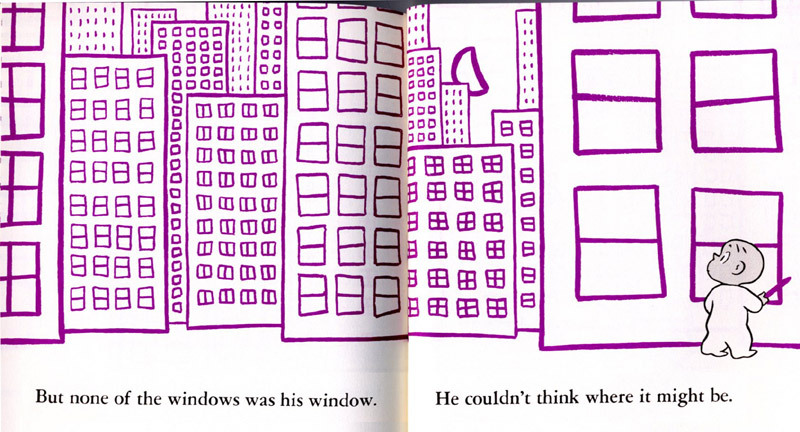 He tried to think where his window ought to be.” Harold extends the horizontal line and walks into a city of many buildings and many windows, but “none of the windows was his window. He couldn’t think where it might be.” Harold cannot find his home because he is in a world of his own creation; his home supposedly exists outside of the drawings. Harold now believes, however, that he exists in the world of illustration, as we have seen with episode with the pies. If this persists, he will never escape. “Then, suddenly, Harold remembered. He remembered where his bedroom window was, when there was a moon. It was always right around the moon.” The solution found, he draws a window around the moon. The moon, remember, is the only part of his drawings that mysteriously follows him wherever he goes and never needs to be redrawn. “And then Harold made his bed. He got in it and he drew up the covers.” The delicious puns of “making” his bed and “drawing up” his covers, distract the reader into thinking the books ends well. But Harold has not found his way out of the world of his drawings. Unlike Max from Where the Wild Things Are, he has not found his way out of his imagination to his real home or his parents. “The purple crayon dropped on the floor. And Harold dropped off to sleep.” The next page is blank; Harold has vanished, along with his world. A happy ending? Not if you carry through the metafictional reading to its logical conclusion. Harold and the Purple Crayon is not a fantasy. It is a nightmare. As in the parody illustration below (for a t-shirt created by Lucky in 1988 for Shirt.Woot! ), Harold has been devoured by the world of his own imagination, because he lacks the meta-awareness to realize that he too is a drawing, although a drawing of a different color. The purple crayon is broken. Harold, a drawing, is no longer able to make his own world and thus continue his existence. The rest is silence. Johnson, Crockett. 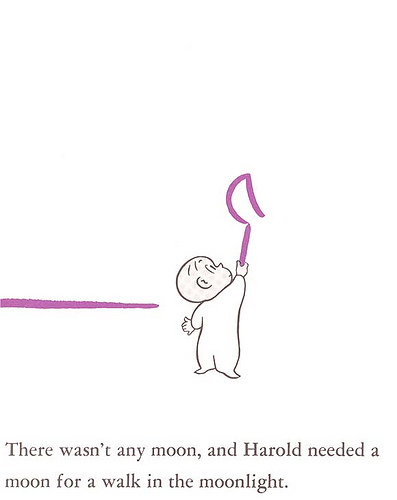 Harold and the Purple Crayon. New York: Harper & Row, Publishers, 1955. 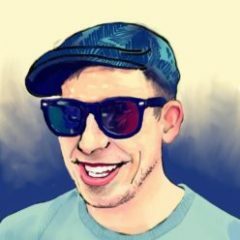 Fantastic write up. Loved the book, but always found it unsettling–even disturbing. Now I know why. I do tend to agree with your assessment.